J&K Diploma Polytechnic Entrance Test 2018 (जम्मू-कश्मीर डिप्लोमा पॉलिटेक्निक प्रवेश परीक्षा आवेदन पत्र): J&K Diploma polytechnic entrance test is conducted by Jammu and Kashmir Board of Professional Entrance Examination (JAKBOPEE). It is a state level exam which is conducted for the admissions in the 3- year technical course in different institutions in J&K. J&K Diploma polytechnic entrance test 2018 will be conducted in May 2018. 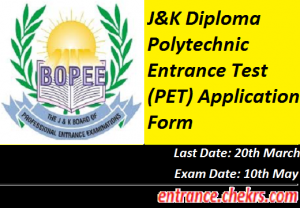 J&K Diploma Polytechnic Entrance Test (PET) Registration Form 2018 will be available at jakbopee.net from February 2018. After the successful application, candidates need to appear in the entrance exam, that will be conducted on in May 2018. About JAKBOPEE: The full form of JAKBOPEE is Jammu and Kashmir Board of professional Entrance Examination. It was established by the act of state legislature, under this act the board is assigned with the conducting of entrance tests and for the selections of the aspirants for admission in various courses in the State of Jammu And Kashmir. Candidate must be a permanent resident of Jammu and Kashmir. The candidate must have passed secondary school or any equivalent examination from a recognized statutory board. Candidate appearing in 10th can also apply for this exam. Candidate must have scored minimum 40% marks in open merit and 37% marks in case of reserved (SC/ST) category. The candidate must lie between 15 to 18 years of age. J&K Diploma polytechnic entrance test 2018 will be conducted on may 2018. The online and offline application form for the J&K Diploma polytechnic entrance test 2018 is available from February 2018. The last date for the filling the online and offline application forms is March 2018. It is a state level exam which is conducted for the admissions in the 3- year technical course in different institutions in Jammu and Kashmir. For the offline mode, the candidate can purchase the application form of JKBOPEE 2018at the branches of Jammu and Kashmir Bank Ltd or offices of the J&K Board of Professional Entrance Examinations. Candidate should fill the application form correctly. Candidate must use the ball point pen for the filling of the application form and paste his/her recent passport size photo in the given space. The fees are required to be paid only at Branches of Jammu and Kashmir Bank Ltd. The candidate has to send their application form to “J&K Board of Professional Entrance Examinations, Bagat-i-Barzulla, Srinagar, Opposite J&K bank, Barzulla, Srinagar-190005”. Click on the application form for J&K Diploma Polytechnic Entrance Test 2018. The candidate has to fill the registration form carefully with correct details. Applicants have to pay the fee through any one of the payment modes. Then login to the site with their login detail and enter the fee detail. Verify and submit the application form. The fee for the application form is Rs. 800, the payment for the offline mode is to be paid by cash in the notified centres of the J&K board. If the candidate opts the online mode, he/she can pay through net banking, credit card or debit card. Candidate will be selected on the basis of the marks obtained in the entrance exam. The selected candidate who has cleared the cut-off will be invited to register for the counselling process. Then the seat will be allotted to the candidates as per choices filled in the counselling form and the merit list. will be conducted for the admission in diploma programs in different polytechnic institutions. Interested students can check the eligibility criteria for J&K Diploma Polytechnic Entrance Test Online Form 2018. The application form is released on 20th February 2018. The exam will be conducted on May 2018. The last date for the submission of the online registration form is March 2018. For any type of assistance while registering online for J&K Diploma Polytechnic Entrance Test Application Form 2018, you can contact us by commenting at the end of the post, we will respond you as soon as possible.